I end up watching four or five demo reels every week, some are good, some are not. I'd like to share some beginner tips about how not to make and distribute a reel. A demo reel is not meant to get you a job. Its only purpose is to show off what you can do so that you are invited to a job interview. Think of a reel as way to put your foot in the door. As in real world, for this to work, you have to be professional, helpful and trustworthy. The first is supposed to catch a smile. Fact is, no matter how well executed, it has been done to death and will catch a grin instead. As for the title sequence, by all means avoid it. Show off your work and don''t worry about the reel being short. End the reel with a business-card like screen stating your name, email and phone number in an easy to read font. The job application comes by email, is targeted to the company, well written, yet the resume states: "Demo reel available on my site: http://www.domain.tld". Okay, where exactly on your site? Navigating an unknown site is a dumbfounding experience, more so if it's a trendy graphic designer site, with flash panels following your mouse and making unexpected chirping sounds when you hover near the 3d tree on the left. Don't expect many people to do reel hunting more than once in their lives. Really: just link the video, nothing else matters. Or just use YouTube. it's not unprofessional. And with more and more companies using Google Apps for email, a miniature will even appear at the bottom of your message. This may even help with some security policies. Here at VFX Wizard, for example, links in emails are always disabled and browsing to unapproved sites requires using a separate browser. Remember, a demo reel is meant to show off what you can do. No matter how cool a tutorial is, I'm likely to show a reel I like to someone who really knows about this stuff. If part of your reel -maybe the one I liked- is later recognized as being the result of a tutorial, I will feel cheated and still won't know much about your skills. I too can build an Ikea furniture following the instructions, but it's unlikely this can win me a job as furniture designer in Sweden. If you really need to use something from a tutorial, overlay a credit to the author while the clip plays. Crediting other people's work is paramount when it comes to establishing credit for yourself. But overall is really better to employ tutorials to build skill, then show off your very own skills. Small studios often don't have people dedicated to HR. 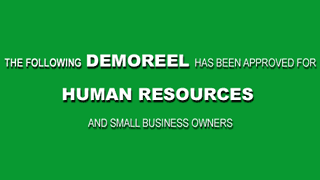 Your reel is going to be watched by someone that's at least partially involved in production. And it's going to be one reel among many others. So try to make things as easy as possible to the viewer — in the end, this will help you.